Keep your vending machines stocked with non-caffeinated beverages and allow employees to take extra breaks in order to stay hydrated. Make sure to keep plenty of water on hand, too. Order workwear made of materials that are lightweight, moisture-wicking and breathable. It also helps for clothes to be loose-fitting. If your job site is outside, take care to provide shaded areas for crew members to get out of the sun and rest. With inside jobs, good air circulation is key. If you do not have air conditioning, use fans. If possible, adjust schedules around cooler times of the day. Provide sunscreen or at least encourage workers to apply it when working outdoors. Sunburn can add to the risk of heat-related illness. 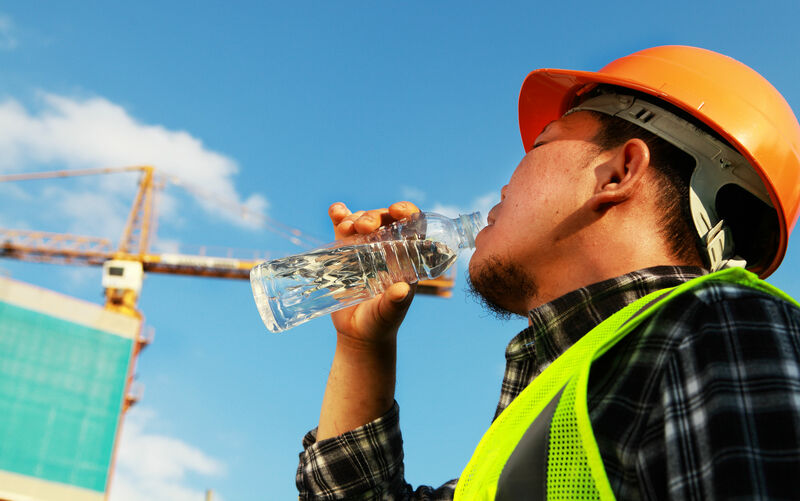 If you are able, allow employees to become acclimated to high temperatures over a period of time, taking longer shifts as their bodies get used to the heat. Ergonomic products like supports and braces, anti-fatigue matting and adjustable equipment can help employees avoid overexertion, conserve energy, and ease discomfort on long, hot summer days. Watch for warning signs like excessive sweating or lack of sweat, clammy skin, rapid pulse, dizziness and confusion, difficulty breathing, and nausea. If these symptoms are present, get the employee to a cool place and seek medical help. Following these guidelines will ensure employees are less likely to become overheated and susceptible to serious issues. Do not take chances. Call Action Industrial Supply for help today. We have a wide array of workwear, gear, equipment and accessories designed with protecting your crew in mind! Dial 800-527-5548 or place an order online. Here’s to a safe summer!